On Saturday, Jan. 31, more than 300 UO students will don their work clothes and come together in a community day of service. The collaborative project brings together student groups from Fraternity and Sorority Life and O Heroes through the CommUniversity program in the office of the dean of students. Its goal is to improve campus-area neighborhoods. What sets this year’s project apart is the leadership of the members of UO’s Fraternity and Sorority Life program. Students will report to McArthur Court at 9 a.m. Saturday to collect their assignment and be welcomed by Eugene Mayor Kitty Piercy and interim UO President Scott Coltrane. 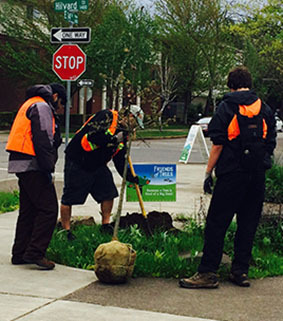 By 10 a.m. they will disperse to one of seven locations throughout the city, where they will be joined by community volunteers led by Nearby Nature and the Eugene Parks and Open Space Division. The student-led projects will focus on litter removal in campus neighborhoods and parks.